Cher (born Cherilyn Sarkisian on 20 May 1946 in El Centro, California), is an American singer and actress. Cher's music singles include, I Got You Babe, If I Could Turn Back Time, and Believe. She is a multiple Grammy Award winning recording artist. 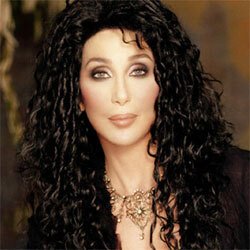 Cher starred in the movies Silkwood, Mask, Moonstruck, and with Christina Aguilera in Burlesque.